Five years already. 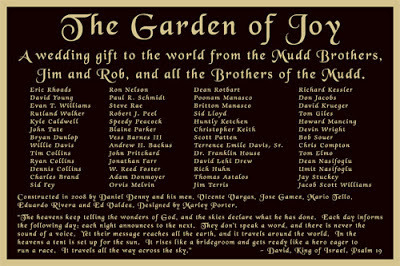 Jonathan passed away on January 27, 2008. Unless you've lost a child, there's no way you can relate to the anguish. The circumstances don't matter. Your children are not suppose to die before you. His Mom and I made a decision in the past 12 months. It's time to celebrate Jonathan's life not continue to mourn his loss. We've been doing that with stories, laughter, food, music, photos, anything that sparks a warm memory. We are creating new traditions and so is his old lacrosse team. It was an unexpected and emotional day on Monday January 28th when an email arrived from Saints Head Coach J. B. Clarke. The team would honour Jonathan at their practice. 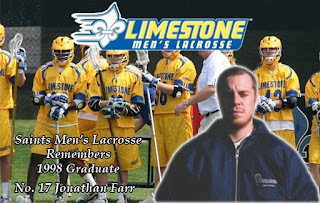 The player now wearing #17 would read up on Jonathan's life and lacrosse career, then he would speak to the team. I cried. They also remembered Jonathan with a front page post on the Limestone Saints website, including a link to the story I wrote about him in September 2011, a story I re-post yearly. Yesterday following practice Nick Schmell (sophomore) who wears #17 spoke about Jonathan to the team. He did a great job highlighting Jon's accomplishments and passions. It will be our new tradition to have our #17 speak about Jon annually to the team. We will also begin the tradition of having #17 reserved for a Canadian player each year. Nick will graduate in two years and Colton Watkinson ( Ontario) will wear jersey # 17. Have a great spring Mr. Farr. I will Coach, thanks to you, the other coaches and Director of Athletics Mike Cerino. Mike was Jonathan's coach when he played for the Saints. Jonathan has also been remembered by an old friend. Roy H. Williams has built his dream. It's called the Wizard Academy, a communications school. The campus has incredible architecture with many areas to just sit and dream. 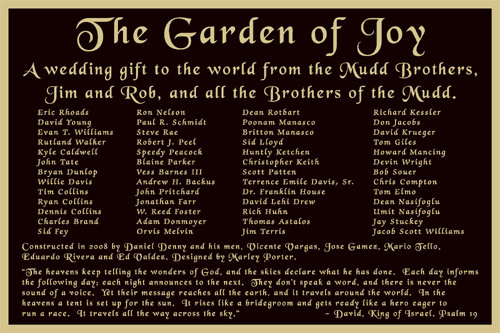 One of them is The Garden of Joy where Roy has honoured many by including their names on the plaque.